According to Kommersant’s sources, Ankara can count on receiving new status within the SCO as soon as 2012. The US, meanwhile, will most likely not be allowed to join the organization due to objections from a number of Central Asian countries. Several diplomatic sources from the SCO member states have informed Kommersant that Turkey and the US have begun moving towards the status of dialogue partner with the SCO. According to Kommersant’s interlocutors, Ankara has made further progress by already having submitted an official application to the SCO secretariat in Beijing. And the US, say diplomats, has just begun holding informal consultations and gauging the opinions of the organization’s member states. In the ten years since creation of the SCO (in addition to Russia, its members include China, Kazakhstan, Kyrgyzstan, Tajikistan, and Uzbekistan), Moscow has been actively seeking the organization’s recognition at international level. To a great extent it was due to the fact that during Vladimir Putin’s presidency the RF was trying to use the SCO as a counterweight to the growing influence of the United States in Central Asia. The call for the US to finally determine the date of withdrawal of its troops from regional military bases was made at the 2005 summit in Astana by the SCO. In order to give more weight to these demands, Russia was trying to make sure that the authority of the SCO was comparable to that of alliances in which the tone is set by the United States – primarily NATO. Since its creation the SCO has been able to form partnerships with other international structures such as the UN, the OSCE, as well as associations patronized by Russia, such as the CIS, the CSTO and the EurAsEC. Now, the circle of global players who recognize the SCO as a serious organization is expanding with Turkey, one of the leading powers in the Middle East and Central Asia, as well as the global superpower, United States. “Ankara and Washington’s interest proves that we were able to create a serious and influential organization in record time,” a source in Russia’s Foreign Ministry tells Kommersant. 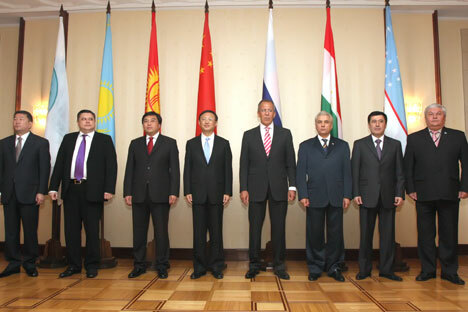 The position of dialogue partner in the SCO was established in August, 2008. According to the document, “the status of partner is granted to a country or organization that shares the goals and principles of the SCO and wants to establish equal, mutually-beneficial partnership with the organization”. Meanwhile, the status of dialogue partner is lower than the status of observer. Partners are able to participate only in selected SCO events. Moreover, they do not have access to the organization’s unpublished documents (but they can obtain them upon request, given there are no restrictions on their distribution). A source in the State Department has a similar explanation of the US interest in the SCO: “We have underestimated the potential of this structure. Surprisingly, in 10 years Moscow and Beijing were able to create an organization with a coherent vision and growing influence. Of course, it’s not NATO, as the values of the SCO member states are entirely different, and yet it is an interesting format with potential for growth. We would like to know more about the work of the organization.” According to Kommersant’s sources, the US has not yet submitted an official application for the status of dialogue partner, but has already clearly indicated its interest in cooperating with the SCO. However, representatives of Russia’s Foreign Ministry doubt that Washington would decide to get closer to the SCO if it was dominated solely by Moscow. “There are two central forces in the SCO – Russia and China. The US would hardly support an organization in which Russia alone holds a dominant position as this does not benefit the US,” a source in Russia’s Foreign Ministry told Kommersant. Due to the objections of certain SCO members, it is possible that the US will not reach the stage of submitting an official application, says Kommersant’s interlocutor. “In the SCO, decisions are made on a consensus basis, and it turns out that we are unable to accept the US as our partner. For Washington, this situation would be somewhat humiliating. And for the SCO, which advocates the principle of openness, declining the application would be not be easy. So, both sides will probably try to spare themselves the embarrassment."